There is an abundance of things to do in Chicago, including things to do in downtown Chicago, and how much vacationers are able to enjoy is limited only by the amount of time they have to spend in the city. From festivals and attractions such as the Ferris wheel at Navy Pier to the array of free things to do in Chicago, the list is long and varied. One of the many things to do in Chicago that are fun for the whole family is a trip to the Brookfield Zoo, where viewing windows allow visitors to get up close to the resident bears. Tropic World, featuring an array of primates, is one of the largest indoor exhibits in the world. Additional enriching things to do in Chicago include peering through giant telescopes to experience outer space at the Adler Planetarium or taking advantage of the interactive exhibits or tours at the Museum of Science and Industry. If you're interested in going to multiple museums during your Chicago vacation, consider visiting the Museum Campus, which, along with the planetarium, is also home to the Field Museum and the Shedd Aquarium. Chicago activities throughout the year are numerous and many revolve around live concerts, cultural festivals, food fests, parades, fairs, and entertaining shows. Two major Chicago activities for visitors who are looking for things to do in downtown Chicago, can attend the Chicago Blues Festival and the Chicago Jazz Festival, both long-running annual events. The Scottish Festival & Highland Games, Irish American Heritage Festival, Greek Festival, Puerto Rican Day Parade, Indian Cultural Festival, and Latin Music Festival celebrate culture, food, music, and traditions. The fun things to do in Chicago are numerous and plenty revolve around the local cuisine, being celebrated in many food festivals including the Taste of Chicago, which plays host to local restaurants providing samples of cultural food from the Chicago-style hot dog to haute cuisine. There are more food festivals throughout the year including the Taste of Riverwalk, Taste of Randolph, and the Ribs 'n' Soul Festival. Another of the fun things to do in Chicago, especially for families, is to experience the variety of fairs the city hosts which include the Wicker Park Fair, Gold Coast Art Fair, Chinatown Summer Fair, Mag Mile Art Festival, St. Josaphat Summerfest, Holiday Sports Fest, and the annual Sheffield Garden Walk. Additional Chicago activities visitors can enjoy are nightlife locations, bars and pubs, and dance clubs with live music, dance floors, state-of-the-art sound systems, and atmosphere at local established haunts such as the Original Mother's and the Lodge Tavern both located on Division Street. Visitors interested in listening to the blues can head for the legendary House of Blues to take in a concert. Things to do in downtown Chicago are plentiful, and they offer a little something for everyone. A visit to the Hancock Observatory lets visitors look down 1,000 feet from the only open-air skywalk in Chicago to take in views of the Magnificent Mile and surrounding areas. The Chicago History Museum has a collection of 22 million artifacts, and the permanent exhibits at the Art Institute of Chicago include contemporary and Impressionist paintings, photography, sculpture, and tapestries. More things to do in downtown Chicago include a visit to Grant Park, Buddy Guy's legends blues club, or a trip to the Sears Tower observation deck to see the city skyline. While searching for things to do, visitors will find many free things to do in Chicago. 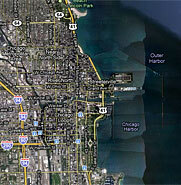 The Oak Street, North Avenue, and Ohio Street beaches located along Lake Michigan are popular tourist venues. Riverwalk and the Riverwalk Gateway provide the perfect place for a leisurely stroll along the shore with monuments, statues, and a pictorial history of Chicago along the way. The Chicago Cultural Center, Lincoln Park Zoo, annual Do-Division Street Fest & Sidewalk Sale, Garfield Park Conservatory, Millennium Park, Museum of Contemporary Art, and the annual Air and Water Show are just a sampling of the additional free activities in the city.